Can we please stop saying that ’speed is a skill’? The specific ability to run fast may be a skill (or, more correctly, may require some level of skillfulness), but speed - as defined by the distance traveled per unit of time - is not. Speed is a scalar quantity that defines how fast an object is moving; distinct from velocity - which is a vector quantity, presupposing a direction. Simply - speed is about magnitude; while velocity is about magnitude and direction. So let’s stop saying they are. With the horsepower that many of the athletes I work with have, I am simply not comfortable throwing them on the track without a clear understanding of the current state of their dynamic system. There are many ways to do this - i.e subjective feedback, pre-responded questionnaires, objective pre-session monitoring, etc -, but if we don’t get our hands on them, we are potentially missing out on information that could be very important to how we progress the training session. 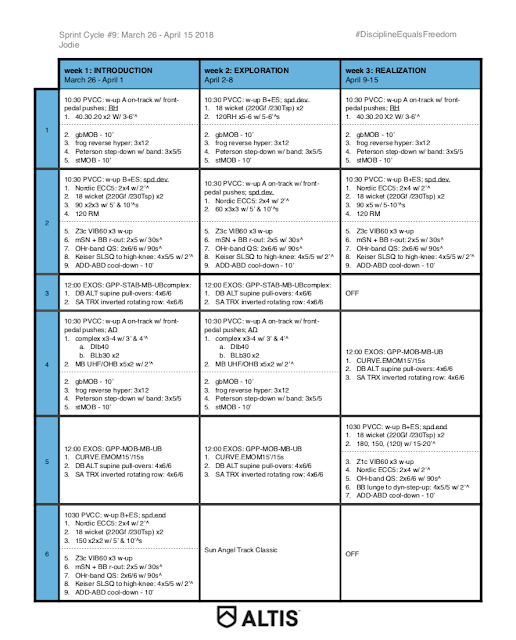 Many - and perhaps even most - coaches at the elite level now have an idea of what their objective for a training session is for each day, and have probably scripted something precise, but are open to the possibility that they may have to change the details of the session based on how the athlete shows up. Athlete feedback on the current state of readiness of their musculo-skeletal system is important information when adapting a session. Coach, or therapist, feedback is just as important. It’s not necessarily change that people are uncomfortable with; it is the rate of that change. Change happens - history proceeds: I think people generally accept this. But change has traditionally happened at rates where we may not even be that aware of it, until one morning we wake up, and “HEY - that thing over there that I used to really like - it’s changed!” But because the rate of change was such that we weren’t really aware of it, it wasn’t really a big deal. We just shrug and move along. Essentially - it’s the difference between evolution and revolution. Evolution means ‘unfolding’; it is a story - a narrative of how things change over time. "The way in which these streams of human culture flow is gradual incremental undirected emergent and driven by natural selection among competing ideas. He argues that the human need for top-down ‘reason’ is often just that - our need, and that it is not how our world - and systems within it - has evolved. We place too much emphasis on planning and design, and not enough on natural evolution of things." Paraphrasing Taleb: in a complex world the very notion of ‘cause’ is suspect: ‘another reason to ignore newspapers with the constant supply of causes for things’. I’m watching this documentary on Netflix right now - Wild Wild Country, about a huge group of folk that purchased land, and moved to Oregon in the early 1980s in order to build - from scratch - their own utopian city. Overnight, the neighboring small town of Antelope - and it’s 40 inhabitants - changed. It’s a fascinating look into not only a wonderfully weird cult but also how uncomfortable we are when the rate of change outstrips our expectations. I find myself vacillating between supporting the 40 mostly retiree townsfolk and the bunch of crazies that have moved in next door. Think about this next time you start coaching an athlete who comes from a vastly different program than yours. Think about their comfort level with the program they are coming from - and how this may affect your own programming going forward. There are a lot of questions to ask here … let’s be sure we ask them. Just throwing them into the deep end is a sure recipe for disaster. … an organization must have a way to attract and retain members, or it will cease to exist. At the same time it must constrain people’s behavior, or it won’t be able to get anything done. This means any organization has the oxymoronic goal of being an attractive prison. The more you coordinate and communicate about work, the less you get done. Time is finite. The more time you spend coordinating your efforts, the less time you have to do the actual work. The more you do, the less you can do. As you take on more jobs and tasks, your overall workload increases, which means you have less time to spend on each job. Not only that, you need to spend more time coordinating and switching between tasks, leaving you even less time to do each one. The reward for doing good work is more work. Do a great job at work and you’ll be rewarded with more projects. Do a poor job and you’ll get less work. Be agreeable and people will ask you to do more. Be difficult and disagreeable and people will leave you alone. “The Peter principle is a concept in management theory formulated by educator Laurence J. Peter and published in 1969. It states that the selection of a candidate for a position is based on the candidate's performance in their current role, rather than on abilities relevant to the intended role. 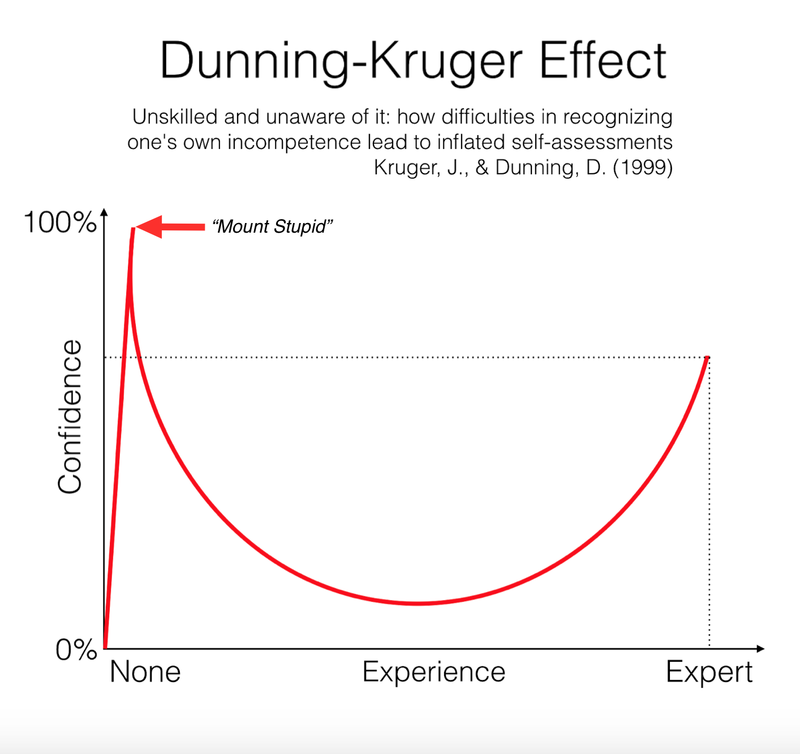 Thus, employees only stop being promoted once they can no longer perform effectively, and "managers rise to the level of their incompetence". The less money you have, the more you can innovate. We tend to think that bigger is better when it comes to budgets. But the fact is that the greatest innovations have been launched by people with scarce resources. Scarcity drives creativity. Big money kills it. If you think that true periodization happens in the real world - you are either not working in sport, or you’re not paying enough attention. You think you’re doing something special by prescribing 77.5% one week, and 82.5% the next? Full disclosure: I was a Bulletproof ‘ambassador' back in 2013 / 2014. At the time, Bulletproof founder Dave Asprey wasn’t doing a heck of a lot more than toting his Bulletproof coffee, and selling a few supplements on his website. I actually enjoyed the morning coffee with grass-fed butter and MCT oil, and when I got an email from someone at Bulletproof asking if I wanted to be an Ambassador, I duly accepted. This meant - for $300/month in free product, I would have to shoot out a social media post once in a while. Pretty good deal, I thought - as whilst I wasn’t necessarily comfortable with what Asprey was beginning to communicate (his straw man mycotoxin argument, for instance), his motives seemed to be sincere. Fast forward 12 months, and I was increasingly uncomfortable with his message - and his madness (the ridiculous glasses and the $10 markup on insulated coffee canisters, for example); to the point where I no longer posted on their behalf, and let my ‘ambassadorship’ run out (even though - to be honest - I found their supplement products to be of pretty high quality - and feel that they probably still are). What I was most uncomfortable with though, was the same reason I was turned off by the messaging from Tim Ferriss - the supposed promise of a shortcut to health, wealth, success, whatever …. The ‘hacking’ movement had become a full-blown fad, reliant upon pushing pseudo-scientific gobbledegook to an increasingly gullible general public. 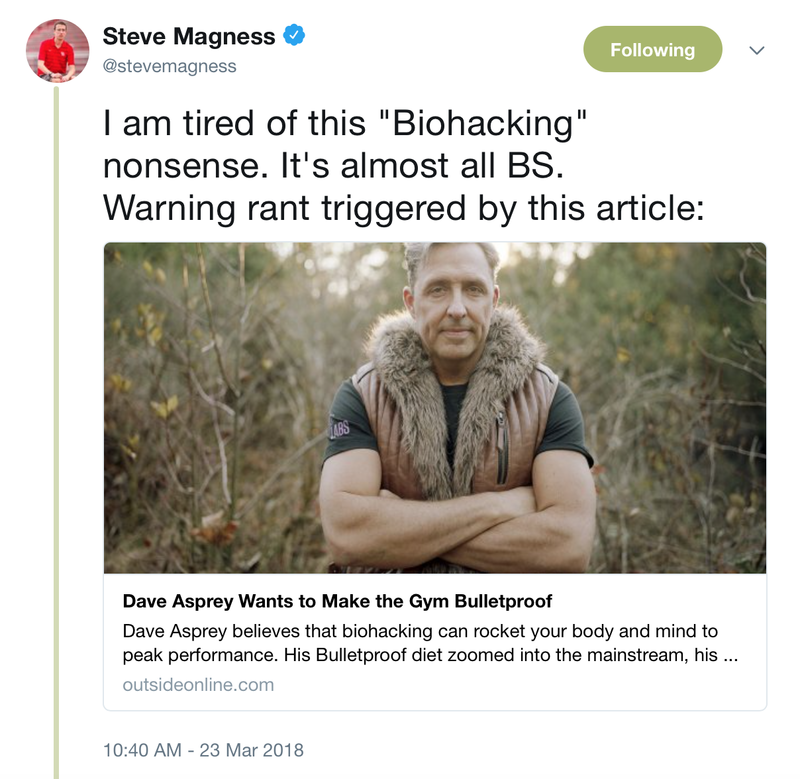 I encourage you to read the review of Bulletproof and Asprey that Steve Magness’ wrote on his blog back in 2014. This week, Magness posted a Twitter primer for those not familiar, in response to a recent article n Outside Magazine, by Nick Heil. Heil closes with what is truly the definition of being healthy. “Let’s investigate the true strength of the tree; the trunk. What led to the current state of the media? An argument can be made that, while things were going this way anyway, Gawker Media - and it’s founder-CEO Nick Denton - did the most ‘damage’. Ryan Holiday’s new book details Peter Thiel’s decade-long endeavor to put Gawker out of business (motivated by Denton's website ‘outing’ Thiel in 2007). Thiel is not the most likable character, and you can argue about his ethics throughout this ‘conspiracy’ - but it’s even harder to respect the ‘journalism’ of Gawker. In the first year that this conspiracy is picking up steam, Gawker Media would post something like 100,000 articles across its eight sites. Almost none of these pieces see an editor before they go live. In 2012 alone, Gawker would find itself the recipient of multiple leaks of celebrity photos, it would unmask a famous internet troll, it would go after politicians, break technology news, publish controversial first-person essays, repeat gossip, and antagonize the sports world. Most of its posts were ephemeral, simple aggregation of the news and trends of the day. Not all, though. He had designed Gawker to have an insatiable maw — tying it to the limitless appetite for content of the internet. It was founded, remember, by paying writers for each morsel they dropped into it, not how nutritious each morsel was. As technology improved, Gawker simply switched to paying by the page view and then later shifted to unique views — essentially paying by the calorie instead of the crumb. Journalism (and writing in general) should be held to a higher standard. If you have a platform, then you have a responsibility to produce content that is not deliberately malicious, false, exaggerated, and self-serving. I would even argue that you have a responsibility to ensure your motivation is true. It’s too easy to fool people into buying anything these days. The only way around this is if those producing content hold themselves to a higher standard. We have a serious problem, and it goes far beyond “fake news.” Too many Americans have no idea how to properly read a social media feed. As we’re coming to learn more and more, such ignorance seems to be plaguing almost everybody — regardless of educational attainment, economic class, age, race, political affiliation or gender. With that in mind, here are three easy steps each of us can take to help build a better civic polity. Some very smart people are helping to spread some very dumb ideas. No link? Not news! Every time somebody tweets “BREAKING” a little bell should go off in your head. Before you even read the rest of the news, look for the link. Why am I talking? My wife is a psychotherapist, and occasionally I skim her Psychotherapy Networker magazine. I read a piece by a therapist who realized his most effective communicative moments often occurred when he asked himself a simple question: “Why am I talking?” Inevitably this question shut him up and allowed him to absorb much more information. “Why am I talking” works out to a great acronym: WAIT. If we all just asked ourselves this simple question immediately before posting or retweeting, we’d all be better off. I’m not sure how I happened upon this podcast - I have always enjoyed Keith Baar’s thoughts on Twitter, and have communicated with him a little over the last couple of years, and somehow found upon a pod I have never heard about before: Sigma Nutrition Radio, hosted by Danny Lemon. This was an excellent episode and included a good overview of the research Dr. Baar has been undertaking over the last few years. “… when we talk about the musculoskeletal or a muscle-tendon-bone system. We've got the extracellular matrix within the muscle, and then we've got the extracellular matrix within the tendon. So what you can do is you can do exercise that's going to increase the stiffness of the extracellular matrix of the muscle, but it could also at the same time decrease the stiffness of the connective tissue within the tendon, and the reverse is true and all of the different combinations are true. So what you're looking to do is as you train or as you do other things that are going to improve muscle function is you're looking for the connective tissue within your muscle to become stiffer and better able to transmit force and you're looking for your tendon to also become somewhat stiffer and to be better able to transmit force. If you're only training with fast movements, and fast movements are specifically important for the tendon stiffness, the faster your movement is the more your tendon is going to become stiffer over time with training; the slower your movement is the less stiff your tendon is going to be over time. “… what we started considering was the idea that gelatins or bone broths would be really beneficial as a way to improve connective tissue function, improve return to play or accelerate people’s return to play after an injury. I enjoyed reading a few of the articles on Lemon’s site, including a short one on the gluten craze. The concluding remarks echo where I currently sit. "The stories about the past are so good that they create an illusion that life is understandable, and they create an illusion that you can predict the future,"
This was one of the best pods of the year. I’ve been listening to Hidden Brain for a few years now, and this is one of the best. I’m not going to share any of my notes - just go listen to it! Harris has been posting a lot of his live events lately. I’ve enjoyed them all. This one was especially interesting. I haven’t had time for my second listen yet - so, sorry - no notes. What are the main ideas of this? How do they relate to what I already know? How would I put this in my own words explaining it to somebody else? “If you want to have a different world, it is on you to make it so. It will not be easy to do it—it may even require things that you are reluctant to consider. It always has. Moreover, that is your obligation if you are called to a higher task. To do what it takes, to see it through. I have been reading your posts regularly. I need to say that you are doing a fantastic job. I am sharing https://nexter.org this blog here for more this kinda news. Please keep up the great work.